Gazprom considers Ukraine’s position a form of blackmail and a method to negotiate an ultra-low price, Aleksey Miller, head of Russia's Gazprom, said on Monday. “These absurd and unreasonable actions will ultimately hurt the Ukrainian economy, but after the Minister of Foreign Affairs comment last week, I am surprised by very little,” Prime Minister Dmitry Medvedev said after holding talks with Gazprom head Aleksey Miller and Russia’s Energy Minister Aleksandr Novak. “Russia is ready to continue gas talks with Ukraine, but only on the condition of debt repayment,” Medvedev said at the meeting, noting Ukraine's outstanding debt of $4.5 billion. On Monday Gazprom introduced a prepayment system for Ukraine, who is months behind on its gas bills, and in the future will only get natural gas it pays for in advance. Russia has offered Ukraine a final gas price of $385 per 1,000 cubic meters, but Ukraine has requested an interim price of $326, which was suggested by the EU. “The terms offered to Kiev on gas were better than those that were given to the Yanukovich government,” Miller said. Under Yanukovich's tenure, Ukraine scored a major discount and imported natural gas for $268.50 per 1,000 cubic meters, which was cancelled after his overthrow and the establishment of a coup-appointed government in Kiev. 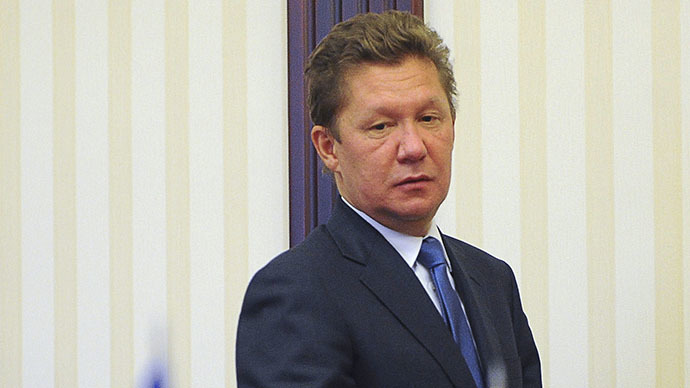 “The system for prepaid gas is the result of the Ukrainian government’s unconstructive stance,” Gazprom head added. Ukraine’s energy minister Yuriy Prodan in turn has confirmed that gas supplies from Moscow to Kiev have been reduced to zero, but insists that deliveries to Europe are safe. Only 185 million cubic meters of natural gas per day will be transported through Ukraine to European markets, Prodan said. Ukraine has more than 14 billion cubic meters of gas in underground storage, enough to meet its needs until December, the chief executive of state gas company Naftogaz said on Monday. Prodan’s comments echo the earlier statements from Gazprom’s spokesperson, who said that as of Monday, Naftogaz, Ukraine’s state-owned gas and oil company, will receive gas only for which prepayment has been made, and since it has paid for nothing, it will receive nothing. “Volumes of gas for European customers will be fully met in compliance with their contracts. Naftogaz must ensure transportation to the delivery points," Kupriyanov said earlier.